Happy Tuesday to all of you! And welcome to this weeks Artists Celebration. In keeping with with the Halloween theme I have been running this month, I have decided to share some wonderful Day Of The Dead art this week, Although not a traditional Halloween Holiday, Dia De Los Muertos which takes place on November 2nd is something of a different animal altogether, but I do so love sugar skulls and they do have that Halloween flair after all. They sure have gained popularity over the past few years, and some artists have come up with beautiful Day Of The Dead inspired artwork! The First Feature of the week goes to Thaneeya McArdle the Queen Of Sugar Skulls! An artist who’s site is dedicated solely to the Day Of The Dead art, first I came across her wonderful informative page on the traditional candy sugar skull. with full instructions on how to make your own, their history, and beautiful photographs. She also sells all sorts of Sugar skull related goodies, tons of great stuff as well as her wonderful art in a multitude of different forms. If you want any history, artwork or home products related to Dia De Los Muertos her site is the one to go to. Aren’t her examples of Traditional Sugar Skulls superb? Full Tutorial on how to make skulls like these on her site! I contacted Thaneeya and found she is one busy lady with a few websites running one dedicated to art instruction and She has founded an online community for artists as well! I just became a member come on over and join me there! They have a sugar skull challenge going on right now. She also has her works available in cross stitch patterns at Heaven and Earth Designs. Next Featured artists are the Huichol People of Western Mexico, They were commissioned by Our exQuisite Corpse to create these wonderful Beaded Human resin skulls. Each one is hand beaded using wax on a resin base. 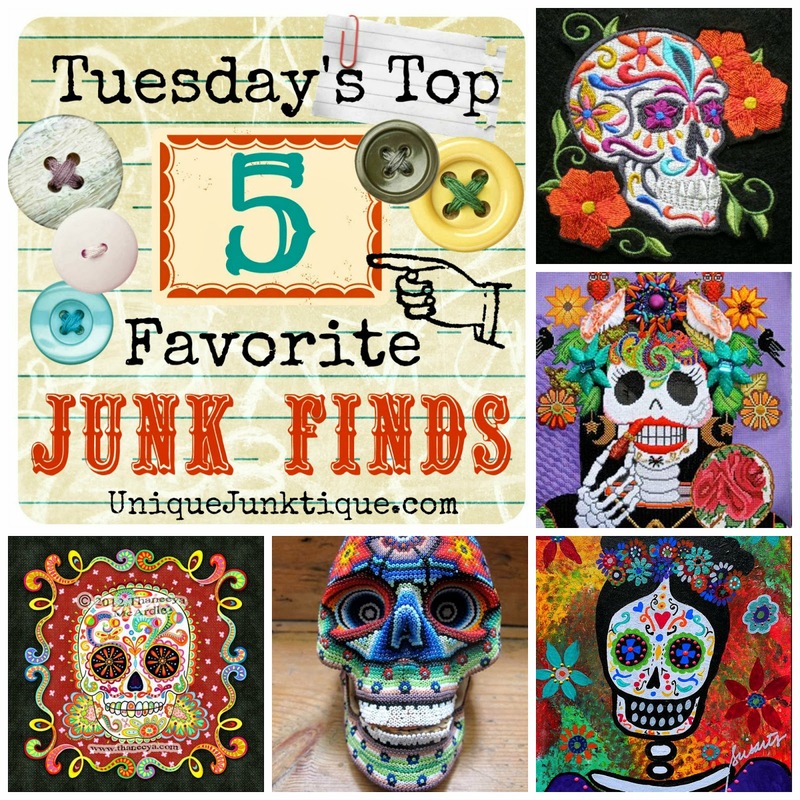 Just look at the craftsmanship on these sugar skull inspired works! I found some great examples of Day Of The Dead art needlepoint charts at Kathy’s Needleworks by the Pristine Cartera Turkus, I would love to grab my needle and make some of these as well! Wonderful Artwork! Which of course lead to a search on the artist for the next feature, and I found Pristine’s Gallery site, where I learned more about her. She is a self taught artist that hails from the Philippines and resides in California, you can purchase her prints and originals on her Gallery site and Ebay. Look at her works, aren’t they so inspiring! For the next feature placement, I found this wonderful needlepoint kit put out by Tapestry Flair created from the works of Jose Manual Salas, you can find these kits online but I love the added crewelwork incorporated by this pair of talented artists, Lisa Kessler and Paula Schmidt at The Bestitched Needlepoint Shop in Arizona. Aren’t these gorgeous? They both taught a class featuring these works, they offer additional classes as well! For the fifth featured artist, I found these wonderful Day Of The Dead ArtSugar Skull hand made applique patches on Etsy shop Elsie Michelle, by artist Michelle Gonzalez she has a number of these available along with a plethora of additional designs and does custom orders too! How Fab! Hope you enjoyed this weeks Day OF The Dead Art Celebration, please be sure to visit their respected websites they deserve some recognition, and share the love! And now for the bonus find, the piece de la resistance, the top feature, my favorite sugar skull inspired works by artist Krisztianna. She has created a sculpture for each season, and more! Just look at these incredible renditions such detail and artistry, how truly beautiful and inspiring!